For Adrian, the good father. The Outlander, set in rural Montana and Idaho, won the Books in Canada First Novel Prize and the Dashiell Hammett Prize, and it also made the shortlist for the Commonwealth Writers’ Prize. The book wraps you into the story of a young woman on the run. Nicholas Campbell championed it for 2009’s Canada Reads debates. Read about her cool dad George Wofford here. NPR has the complete story (with very harsh comments from readers, haha). See a photo of JK Rowling’s personal dedication (and drawing) to her dad. – Susan Sladden = a church friend who babysat JK’s daughter Jessica while JK wrote Harry Potter. Thanks to JKRFan for this one! 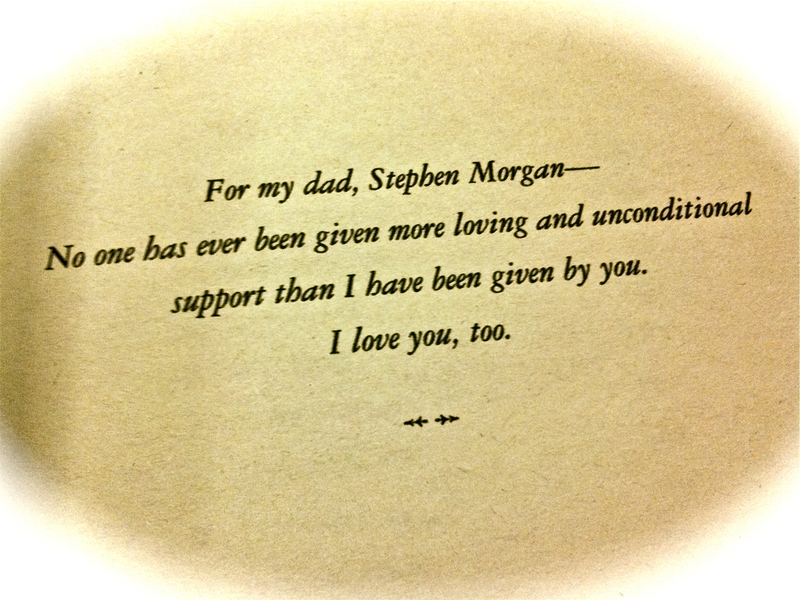 For my dad, Stephen Morgan — No one has ever given more loving and unconditional support than (that which) I have been given by you. I love you, too. – New Moon (2nd novel in the Twilight series), by Stephanie Meyer.